If you want to read a magic system designed around you losing chunks of your personality and memory in exchange for magic. If you like reading frame narrative structures in your books. A book which manages to both have a great plot and have some thematic depth at the same time. Magical wizard duels up the wazoo. Offbrand chocobos. That’s right. Offbrand. Chcobos. This is a single-POV, ‘unreliable narrator’ sort of story. 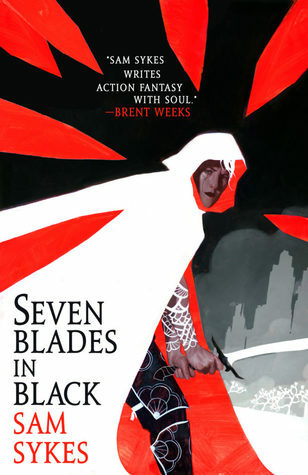 Even if you don’t generally like ‘unreliable narrator’ stories, I think ‘Seven Blades in Black’ might still interest you. It’s that good. This is a first person story. Even if you don’t ordinarily like first person, you might like this. While this book does have occasional passages with memorable description, this book’s prose is workmanly. It’s effective and functional, but it’s not vivid and luscious. This isn’t a bad thing, just a style choice. The pacing is a little slow in the middle. I got this book early via Netgalley for free in exchange for an honest review. I really loved this! If you are a reader with tastes like mine, this is a Highly Recommended read! I’m definitely going to be buying the future books in this series, and I’m not just saying that cause I got this for free. Sal the Cacophany is a gunslinger who roams the wastes of the Scar, killing ‘vagrant’ wizards for money. Coming from a mysterious past, her life goal is something simple: kill the thirty three wizards who stripped her of her magic. With only her magic gun ‘the Cacophany’ for company(yes, Sal named herself after her gun), she’s on a one-woman revenge quest. But Sal isn’t alone in the Scar. The Scar is occupied by two empires: an empire of opera-loving wizards, and an empire of revolutionaries who hate opera loving wizards. Sal, along with all the other ‘vagrant’ wizards hiding in the unoccupied parts of the Scar to avoid conscription, is an enemy of the state for both empires. As a matter of fact, the book opens with Sal having been arrested by the revolutionaries, whereupon she’s instantly put on death-row for being a former wizard. Mere minutes before her execution Sal is given a lifeline: tell the story of how Sal slew her thirty three enemies (or did she slay them? ), and she’ll get to live for a little while longer. Plot: I really liked the frame narrative. It added a lot of intrigue to the ‘whether the POV will survive or not’ story, and it also pulled double-duty of providing the viewpoint of the Revolution, whereas the rest of the story we got the viewpoint of the Opera Wizard Empire. My kudos to Sykes, that was a neat trick to help flesh out the setting. Anyway, beyond the narrative structure, the plot was a compelling revenge plot. Sal’s been stagnating in the Scar for years, until she finally gets the trail of her hated enemies. She finds a secret note, and learns seven of the thirty three are nearby (see the ‘Seven Blades’). She and her loved one(s) are forced to come to terms with their past mistakes and their present relationship turmoil in order to come to move on into the future. And as this is a revenge-plot, there’s lots of fighting. If you like combat, go here. Character: Sal is a deep, self destructive character who has troubles maintaining any relationships for long. The narrative voice of inhabiting her headspace in this first-person story creates a colorful and fun perspective, as she provides commentary on her situation. I liked it. Now, as I do with all my reviews, I’m going to provide some constructive criticism. This book is structured in classic gaming fashion: there’s a final boss, and several mini-boss wizards, monsters, and soldiers leading up to it. Sal, being a murder-quest, goes around killing folks because that’s the plot. Towards the middle of the book there was a pacing slump when Sal was going around killing random folks. The fights were fun to read, don’t get me wrong. However in the end only two fights had much emotional oomph for me the reader: the final boss at the climax of the novel, and the fight where she killed the guy who was pleading for his life (or did she kill him? Was it just a magical illusion? Read to find out!). And that’s it! I had a great time reading this. While it has one or two flaws, I think this book is good enough to make my ‘Best of 2019’ book list. If you want to have a good time, check this out.